Dolly's "Hello God" from Halos & Horns increased two more notches on the Indie World Country independent label country singles chart to reach No. 2 for the week, it was announced Friday. I'm told the Tokion, a Japanese-English language magazine in Los Angeles, offers a Southern theme in its current issue featuring Dolly on the cover and an interview inside. Thanks, Stan! Dolly got a mention in British newspaper The Guardian on Friday. In a story on the Dixie Chicks, it noted that all three Chicks consider Dolly as perhaps the greatest musical and personal inspiration in their lives. "We love her, and she was an early idol for us," noted Martie Maguire. "She was so glamorous, but a real nice lady, too, and she never acted like a diva while always being a true star." The Chicks are expected to contribute a Dolly cover song in a tribute album planned for release this fall on Sugar Hill Records. Read the paper's full story here. Dollywood's annual season opening is only days away now! On Friday, Dolly's Springfest In The Smokies Parade through Pigeon Forge starts at 6 p.m., followed at 9 p.m. by the Blonde Butterfly Bash collectors' convention at Green Valley Motel South, 4109 Parkway in Pigeon Forge (the two-hour event features Dolly merchandise for sale plus special appearances by Dolly's Blueniques band leader Randy Kohrs, Shaunna Larkin and the filmmakers of For The Love Of Dolly -- admission is a $1 donation to the Dollywood Foundation). Dollywood opens to the public at 9 a.m. Saturday, with Dolly expected to make several appearances around the park throughout the day, including her Parade of Nations Parade at 1:30 p.m. and her induction into the Junior Achievement Hall of Fame at a luncheon beginning at 11:30 a.m. And as your webmaster will be there covering the event (and participating in the Bash Friday night -- come by and say hi! ), there will be no Dollymania updates from Thursday until Sunday. Dolly's Halos & Horns falls two spots to No. 64 on the April 5 country albums chart in its 37th chart week, Billboard announced Thursday. The CD remains steady at No. 5 on the bluegrass albums chart. The Songcatcher soundtrack, with the Dolly duet "When Love Is New," also remains steady on the bluegrass chart for a 28th week, coming in at No. 14. The Sweet Home Alabama soundtrack, featuring Dolly's "Marry Me," inches up one to No. 6 on the soundtrack albums chart in its 24th chart week but drops 15 places on the pop albums chart to No. 121. The Dixie Chicks' Home, suffering a 42 percent drop in sales following their controversial anti-war comment, remains at No. 1 on the country albums chart and loses three spots on the pop albums chart to move to No. 7 in its 30th chart week while Shania Twain's Up! remains at No. 2 country and gains two on the pop chart to come in at No. 39 in its 17th chart week. This recap of The Lost Highway, a documentary on country music which concluded its run last weekend in Britain, is provided by Paul at Dolly Parton World (who also notes that his site has just added a new gallery of Dolly pics from the Stars Over Texas special and tells me there is a two-page article on The Lost Highway in the current issue of Country Music People): Last Saturday, the last episode of the four-part series, the UK documentary The Lost Highway: The Story of Country Music, aired. This episode was all about the women of country music titled: "Sweethearts of the Rodeo." Dolly looked wonderful. She wore the same outfit as in the UK documentary about her called Platinum Blonde. She called her music "Dolly's music." Images of her included clips of the music video of "Silver Threads and Golden Needles" with Loretta and Tammy and Dolly in the early days on The Porter Waggoner Show singing "Dumb Blonde" and "Coat of Many Colours." 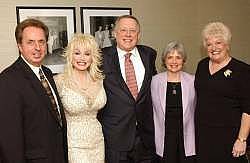 Friends in the music business talked fondly of Dolly including Emmylou Harris. Dolly was also shown later in the program when the documentary focused on the image of women. They showed some fab new photo and a clip of Dolly talking about her image from the UK's Heaven and Earth show. This documentary will air sometime this year in the USA. Thanks, Paul! Chris over at Dolly Parton Central reported Thursday that the Dolly duet slated to appear on Ray Benson's upcoming June release Beyond Time is "Leave That Cowboy Alone," which they co-wrote and originally performed in her television movie Wild Texas Wind. While I haven't found confirmation of this report, CDUniverse has the following track list for the album, which doesn't include that cut: Hands Of Time, Annabelle, Sorry, El Paso, Haven't Gotten To You Yet, Small Town, Ain't Chet Yet, Mary Ann, Misery Loves Company, Get Lost, Long Black Veil and Isn't It Strange. However, I wouldn't trust that store's list too much, because it shows an April 22 release date, but Ray's label says it will be out June 24. Reserve your copy here. Dolly's "Hello God" from Halos & Horns re-captured the No. 1 spot for a third week when PowerSource announced its weekly Christian country countdown for last weekend. The song had spent the last two weeks in the top 5 after two previous weeks at No. 1. It jumped four spots on the chart to return to No. 1. The song also increased one notch on the Indie World Country independent label country singles chart to No. 4 for the week. And on the European Christian Country Chart for April, Dolly's duet with Dottie Rambo, "Stand By The River," falls 12 spots to No. 23. CMH Records has released the track listing and cover art (at left) for its April 8 release Pickin' On Dolly Parton: A Bluegrass Tribute, part of its series of albums recognizing the legends of music with bluegrass instrumental covers of their hits. The package will contain "My Tenessee Mountain Home," "The Bargain Store," "Love Is Like A Butterfly," "Jolene," "9 To 5," "Here You Come Again," "Those Memories Of You," "Coat Of Many Colors," "I Will Always Love You" and a new cut written for this compilation titled "Dolly's Breakdown." In its publicity materials, the label notes: "Dolly Parton's pure voice, legendary songwriting and show-stopping performances took her from the hills of East Tennessee to the top of the music charts. With her infectious energy and overflowing talent, she has conquered the hearts of millions. Her recent return to the mountain music sound of her youth has delighted fans the world over and reinvigorated Bluegrass music. With Pickin' On Dolly Parton, some of Bluegrass music's finest offer thanks with gorgeous instrumental renditions of her most beloved songs. Featuring 'Coat of Many Colors,' 'Jolene' and 'I Will Always Love You,' this collection rings with the pure mountain music sound she helped bring to the world." Reserve your copy here. Audium Records last week announced the signing of Asleep At The Wheel lead singer Ray Benson for a solo album titled Beyond Time, which the label plans to release on June 24. Among those contributing guest vocals on the disc are Dolly and Delbert McClinton, the label said. Reserve your copy of Ray's album here! The Ottawa, Canada, publication Forever Young features Dolly as its cover story for March. See the cover here and read the article here. Thanks, Frank! The British newspaper The Telegraph on Saturday offered a story on the rise of popularity for Americana music overseas, with an introduction recounting the massive praise which the public and critics gave Dolly for her tour of the region late last year. Read the story here. The Knoxville News-Sentinel continued its coverage last week of WIVK 50th anniversary celebrations. Among the items posted while your webmaster was away: audio clips from the ceremonies (including one from Dolly) posted here late Thursday and another review of the events posted here on Sunday. If you missed its first airing on Monday, be sure to catch the repeat of Travel Channel Secrets: Dollywood scheduled for 6 p.m. Eastern on Saturday (March 29). As was reported here long before the show aired, the hour-long special featured many behind-the-scenes stories about various rides at Dollywood and Dolly's Splash Country, peeks into Dolly's dressing room and her apartment on the park's grounds, interviews with staff, tons of footage of Dolly from last year's season opening festivities and interviews with her around the park all throughout the program. Dolly's Halos & Horns falls seven spots to No. 62 on the March 29 country albums chart in its 36th chart week, Billboard announced Thursday. The CD loses one notch to No. 5 on the bluegrass albums chart. The Songcatcher soundtrack, with the Dolly duet "When Love Is New," inches up one on the bluegrass chart for a 27th week, coming in at No. 14. The Sweet Home Alabama soundtrack, featuring Dolly's "Marry Me," remains steady at No. 7 on the soundtrack albums chart in its 23rd chart week but drops 13 places on the pop albums chart to No. 106. The Dixie Chicks' Home remains at No. 1 on the country albums chart and gains two spots on the pop albums chart to move to No. 4 in its 29th chart week despite backlash over their lead singer's recent anti-war comments (and I refuse to listen to any station which has banned the Chicks in response to Natalie's brave protest), while Shania Twain's Up! remains at No. 2 country but loses another five on the pop chart to come in at No. 41 in its 16th chart week. The Knoxville News-Sentinel on Thursday reported on Wednesday night's 50th anniversary celebration for Knoxville radio station WIVK. Dolly was the first to address the crowd, talking about her working on the station as a teen, telling a few jokes, reading the lyrics to the "Ballad Of Davy Crockett" and singing an a cappella version of "I Will Always Love You." Read the full story and see a photo of Dolly arriving at the event here. CMT.com offered a brief on its news page Wednesday on the upcoming Blonde Butterfly Bash Dolly fan convention (to be held from 9 p.m. until 11 p.m. Friday, April 4, at the Green Valley Motel South in Pigeon Forge with admission being a $1 donation to the Dollywood Foundation). The story, based on a press release from Dollymania, notes the attendance of Blueniques leader Randy Kohrs and the filmmakers behind the documentary For The Love Of Dolly. Read the story here. Thanks to Sandra Pinkoski of the Tennessee Star Journal in Pigeon Forge for sending in a couple of photos of Dolly from her Tennessee Arts Commission Governor's Awards in the Arts ceremony earlier this week, where she was presented with the Lifetime Achievement Award. Approximately 1,700 people attended the ceremony, held in Nashville's historic Ryman Auditorium on Tuesday. See the shots here. Thanks, Sandra! Images courtesy the Tennessee Arts Commission. Used with permission. Wanna know how to make Dolly's recipe for meatloaf? Well, it's included in the new book Grits (Girls Raised In The South) Guide To Life, which will be released next month by Dutton Books. According to a Lexington Herald-Leader review on Wednesday, Dolly contributed her recipe for the collection of stories about women from the South. Read the review here and order your copy of the book here. Dolly is not going to play the Glastonbury Music Festival in England, contrary to published reports, her longtime friend and producer Steve Buckingham tells Dollymania. As has been noted here, the British media have reported for months that Dolly was rumored to be a special guest at the summer event, culminating in a report carried by most major British news resources last week and noted here Thursday night that sources involved in the festival said Dolly had been in talks with organizers and was likely to play on June 29. "None of this is true," Buckingham told Dollymania on Monday. "Dolly has no plans to return to the UK at this time and certainly has not scheduled any performances." He added that there was a concern that fans overseas may be purchasing tickets to the festival on the assumption that Dolly was to appear. Buckingham, an executive at Welk Music, the parent company of Dolly's label, Sugar Hill, said efforts are being made through their British publicist to correct the erroneous reports. The Blonde Butterfly Bash Dolly collectors' convention during Dollywood's opening weekend festivities is getting bigger. Shaunna Larkin will be joining her fianc�, Randy Kohrs, to meet with fans at the event, it was confirmed Sunday night. Larkin and her sister make up the duo The Larkins, who perform regularly at Dollywood as a quartet with their parents. The siblings' debut album will be released in July on Koch-Audium Records featuring Dolly guest vocals on their cover of her classic, "Steady As The Rain." Previously announced guest Randy Kohrs, the leader of Dolly's touring band the Blueniques, proposed to Larkin on stage during Dolly's concert last summer at the Ryman Auditorium in Nashville. In related news, Dollymania has issued the official press release for the Bash, available here. It was published in its entirety on Monday by the online newspaper The Chattanoogan, and several other media outlets have expressed an interest in the story. The Second Annual Blonde Butterfly Bash is scheduled from 9 p.m. until 11 p.m. Friday, April 4, at the Green Valley Motel South in Pigeon Forge. Dolly got a little coverage on NPR's Morning Edition on Monday, with a story on the Irish CD A Woman's Heart: A Decade On, which was released in November. The CD includes Dolly's version of "In The Sweet By And By" with Altan from her 2001 collection Little Sparrow. A clip of Dolly's song was played on the show, and the producer talked about the recording. Listen to it by visiting here and scrolling down to the story titled "Mary Black." Thanks, Hartman! The Orlando Business Journal on Monday ran a story about the four-week delay in the grand opening of Dolly's Dixie Stampede there. The restaurant is scheduled to open on June 19. Read their story here. Dolly's "Hello God" from Halos & Horns has mixed chart news this week. It drops one on the Power Source weekly Christian country countdown to come in at No. 5 (it had previously been No. 1 for two weeks in a row on this chart), but on the Indie World Country independent labels country singles chart, it shoots up 17 notches to No. 5. In other gospel news, Dolly's duet with Dottie Rambo on "Stand By The River" moves up five spots to No. 10 on the Singing News chart. Knoxville News-Sentinel columnist Don Williams had an interesting story in Friday's paper about often being confused with the singer of the same name, including a note about a time he got the opportunity to sing with Dolly. Read it here. The paper also gave Dolly a "kudos" on its editorial page Saturday for her Lifetime Achievement Award from the Tennessee Arts Commission Governor's Awards in the Arts. Read it here. I'm told Dolly got a mention on The View last Thursday. The topic was breast implants and questioning how difficult it must be to function with huge breasts. Of course, the conversation turned to Dolly, with the comment that she hasn't seem to had any problems with hers. Thanks, Jonathan! The Knoxville News-Sentinel on Sunday offered a preview of Wednesday's 50th anniversary celebration for WIVK radio here telling the story of the Knoxville station where Dolly got her start as a child. A sidebar here includes a quote from Dolly on the station and a photo of her visiting it in the 1970s. Tanya Tucker was quoted on CMT.com last week saying she hopes her new single breaks into the top 10 on the country charts because it would make her the first female artist to have top 10 singles across four decades. Sorry, Tanya, Dolly already has that honor, with six in the 1960s, 25 in the 1970s, 23 in the 1980s and one in the 1990s for a total of 55, the most for any female artist. (However, as many of Dolly's hits have been duets, Tanya would be able to claim the record for having "solo" top 10 singles for a female artist across four decades.) Read Tanya's interview here. Dolly's Halos & Horns falls six spots to No. 55 on the March 22 country albums chart in its 35th chart week, Billboard announced Thursday. The CD remains steady at No. 4 on the bluegrass albums chart for its 34th week but drops back off the independent label albums chart, down from No. 40 last week. The Songcatcher soundtrack, with the Dolly duet "When Love Is New," re-enters the bluegrass chart for a 26th week, coming in at No. 15. The Sweet Home Alabama soundtrack, featuring Dolly's "Marry Me," loses one notch to No. 7 on the soundtrack albums chart in its 22nd chart week and drops 14 places on the pop albums chart to No. 93. The Dixie Chicks' Home remains at No. 1 on the country albums chart but drops two to No. 6 on the pop albums chart in its 28th chart week, while Shania Twain's Up! remains at No. 2 country but loses 11 on the pop chart to come in at No. 36 in its 15th chart week. The Green Man Review: Roots And Branches Of Music And Literature this week handed out its "Greenies" Awards online, and critic Stephen Hunt chose Dolly for Best CD in the North American Traditions category for Halos & Horns, noting that the publication's music production editor David Kidney called it "a beautiful album to listen to." Read the full list of honorees here. The Chattanoogan has posted a story on Dolly's parade through Pigeon Forge on April 4 to kick-off the season opening events for Dollywood with an expected crowd of 40,000. Read it here. And remember, if you're going to opening weekend, be sure to stop in at the Blonde Butterfly Bash fan convention from 9 p.m. until 11 p.m. Friday, April 4. Admission is a $1 donation to the Dollywood Foundation. Look for the Bash's official press release to be issued by Dollymania in coming days. Dolly's receiving the Lifetime Achievement Award from the Tennessee Arts Commission on Tuesday made the USA Today online rundown of the Day in Pictures from Wednesday night through Thursday afternoon, including using Dolly's shot as the promo for the feature from the site's front page. As of the time of this update Thursday evening, the photos had already been changed to the next day's set. Thanks, Hartman! A fan was searching through the BBC America website on Thursday and came across two computer wallpaper photos of Dolly and Graham Norton from his Christmas special Graham Goes To Dollywood available for download. Visit their page here and scroll down toward the bottom to access the pics. (They also have a great Absolutely Fabulous one as well!) Thanks, Sean! And Paul over in England with Dolly Parton World alerted me that Dolly is scheduled to appear on the fourth and final installment of the BBC2 series Lost Highway chronicling the history of country music. The one-hour episode airs on the network at 7 p.m. Saturday and will focus on the women of country music. Thanks, Paul! Although VH1's Rock On TV television listings claimed Dolly was to appear on the show, she was nowhere to be seen on Wednesday night's First Annual TV Land Awards. Although she was voted by the network's viewers as winner of the Most Memorable Female Guest Star In A Comedy As Herself for her 1989 appearance on Designing Women, the award was not announced on air, and she was not in attendance. Dolly was her usual bubby self Tuesday night as she accepted the Lifetime Achievement Award from the Tennessee Arts Commission in the Governor's Awards In The Arts in Nashville, according to reports. The Knoxville News-Sentinel has a photo from the event here. The paper reported that Dolly told the crowd: ""This is called a Lifetime Achievement Award, but I ain't done yet. That makes you feel old. I don't feel old. I don't look that old. As long as I have those surgeons in California, I won't look that old." As was previously reported here, the Peasall Sisters performed "Coat Of Many Colors" during the tribute to Dolly. Also honored with the Governor's Award was artist Jim Gray, who created the sculpture of Dolly which adorns the Sevier County Courthouse lawn in Sevierville, Tenn. The Associated Press also has several photos from the event available here. As has been reported here previously, Dolly has for several months been rumored to be planning to appear as part of the Glastonbury Music Festival in England this summer, and British news outlets began reporting on Wednesday that sources confirmed she has been in talks with its organizer to appear as this year's "star guest" on Sunday afternoon, June 29. REM will headline the show on opening night, June 27, with Radiohead set to headline on June 28. Read coverage on Sky News here. The Raleigh, N.C., News Observer reported Wednesday that Shania Twain has definitely signed on to perform on the Dolly tribute album, which Dollymania was the first Dolly site to report on several months ago. The article continued to state that Alison Krauss and Union Station are slated to back up Shania as the instrumentalists on her cut on the disc, expected to be released this fall. Although it didn't cite the specific song Shania will record for the tribute, she has said in interviews that she wants to cover "Coat Of Many Colors" for the project. Read the brief here. No. 8, "Coat Of Many Colors" -- "skillfully weaving her autobiography into the biblical tale of Joseph, . . . It's a painfully honest song." No. 159, "Mule Skinner Blues (Blue Yodel No. 8)" -- "she says good morning to Monroe and Rodgers before flying past them like a jet past a model." No. 226, "The Last Thing On My Mind" with Porter -- Porter and Dolly "make exquisite harmony. But they still sound very far apart." No. 232, "Jolene," 1974 version -- "howling harmonies conjure an apparition out of Wuthering Heights." No. 331, "I Will Always Love You," 1974 version -- "What an ultimate thing to say. Accept no substitutes." No. 356, "In The Good Old Days (When Times Were Bad)" -- "that's what the good old days are for." No. 374, "Daddy Come And Get Me" -- "Here's what became of Dolly's character in 'Down From Dover.'" No. 377, "Those Memories Of You" with Linda Ronstadt and Emmylou Harris -- "sad, sweet harmony." No. 420, "9 to 5" -- "Dolly paid her dues, . . . clung to her dreams, and managed to steer her own ship as it came in." No. 471, "Holdin' On To Nothin'" with Porter -- "they sound so great together." Unfortunately, Dolly didn't get enough votes for "Dagger Through The Heart" to make it into the final five nominees of the CMT Flameworthy Video Awards for Flameworthy Female Video Of The Year, it was announced Tuesday. The video had been one of the 10 finalists for the award, for which she was nominated last year for "Shine." This year's five nominees are: Terri Clark, "I Just Wanna Be Mad;" Martina McBride, "Concrete Angel;" Faith Hill, "Cry;" Shania Twain, "I'm Gonna Getcha Good!" and Rebecca Lynn Howard, "Forgive." You may cast your vote for your favorites here. CMT.com, however, did include a note in its Tuesday news update mentioning Dolly's Lifetime Achievement Award from the Tennessee Arts Commission's Governor's Awards In The Arts, which was scheduled to be presented to her at the Ryman Auditorium in Nashville on Tuesday night. Read it here. And, according to an article in Tuesday's The Tennessean (here), the Peasall Sisters, three girls who sang in O Brother, Where Art Thou?, will be performing their own arrangement of Dolly's "Coat Of Many Colors" in tribute to her at the event. The Orlando Business Journal on Tuesday offered an article on the buffalo herd which will be featured at Dolly's Dixie Stampede in the city when it opens June 19. It notes that Dolly came up with the idea of adding the beasts to the show while on tour in Europe last fall. "The addition of the buffalo gives audiences a real connection to America's history," she said. "The buffalo is a symbol of our nation's strength and freedom." Read the full article here. Although I have yet to get a copy of the full publication to report to you how many Dolly numbers are included, I have come across the top 10 of the new book Heartaches by the Number: Country Music's 500 Greatest Singles (Vanderbilt University Press/Country Music Foundation Press), which was released a couple of weeks ago. Dolly's classic "Coat Of Many Colors" is ranked as the 8th greatest country single of all time by the book's authors, David Cantwell and Bill Friskics-Warren. The rest of the top 10 are: "Born To Lose" (Ted Daffan), No. 10; "Rank Strangers" (The Stanley Brothers), No. 9; "Window Up Above" (George Jones), No. 7; "Crazy Arms" (Ray Price), No. 6; "Don't Be Cruel" (Elvis Presley), No. 5; "Can The Circle Be Unbroken" (The Carter Family), No. 4; "Crazy" (Patsy Cline), No. 3; "Lost Highway" (Hank Williams), No. 2; and "Help Me Make It Through The Night" (Sammi Smith), No. 1. Get your copy of the book here. Dolly's "Hello God" from Halos & Horns is seeing some chart movement this weekend. After two weeks at No. 1 on the PowerSource unofficial weekly Christian country countdown it falls this week three spots to No. 4, while her duet of "Stand By The River" with Dottie Rambo falls out of the top 20, down from No. 20. On the Indie World Country chart, "Hello God" moves up two spots to No. 22. And on the God's Country International Music Chart for February, "Hello God" gains six places to reach No. 12, while "Stand By The River" drops 11 to No. 88. If you're reading this update on Sunday night, you have a few hours left to cast your vote for Dolly in CMT's Flameworthy Video Awards, where she is a preliminary nominee for Flameworthy Female Video Of The Year for "Dagger Through The Heart." Each fan (who must first be a registered user of CMT.com) may vote once for their favorites through Sunday night. Each category will be trimmed to five final nominees, who will be announced on Tuesday, at which time fans may vote again through April 5. Winners will be announced April 7. Click here to vote. And a reminder that Dolly will be honored with the Lifetime Achievement Award by the Tennessee Arts Commission Tuesday night at the Ryman Auditorium in Nashville. As Dollymania was the first Dolly site to report, Dolly was selected as this year's recipient as part of the 2003 Governor's Awards in the Arts. Tickets to the event are free. Call 615-458-8720 for information. The Knoxville News-Sentinel on Saturday had a preview of the festivities here. With sales influenced by Grammy exposure due to her two nominations, Dolly's Halos & Horns jumps up seven spots to come in at No. 49 on the March 15 country albums chart in its 34th chart week, Billboard announced Thursday. The CD inches up two to No. 4 on the bluegrass albums chart for its 33rd week and re-enters the independent label albums chart at No. 40 for a 28th week. This was the first chart week reflecting post-Grammy sales. The Sweet Home Alabama soundtrack, featuring Dolly's "Marry Me," loses one to reach No. 6 on the soundtrack albums chart in its 21st chart week and drops 12 places on the pop albums chart to No. 79. The Dixie Chicks' Home remains at No. 1 on the country albums chart and No. 4 on the pop albums chart in its 27th chart week, while Shania Twain's Up! remains at No. 2 country but loses five on the pop chart to come in at No. 25 in its 14th chart week. The Nashville City Paper on Thursday had a story on Dolly's Lifetime Achievement Award from the Tennessee Arts Commission. Read it here. The Mountain Press on Wednesday had an article on Dolly's Dixie Stampede Orlando opening on June 19, noting its buffalo herd and a videotaped finale of Dolly's "Color Me America." Also, the article noted that the backdrops of the show will be different than the Southern mansion used at the restaurant's other locations. Instead, several different sets will be used, including one of the New York skyline. Read the full story here. The Tennessean on Wednesday had an article about Dolly being honored with the Tennessee Arts Commission's Lifetime Achievement Award next Tuesday at the Governor's Awards in the Arts. Read it here. And some TV listings are including Dolly among the guests slated to appear on the broadcast of the TV Land Awards, which will air at 9 p.m. Eastern on March 12 on TV Land and Nick At Nite. Dolly won the show's award for Most Memorable Female Guest Star In A Comedy As Herself for her 1989 appearance on Designing Women. Officials with Dollywood and the Orlando Convention & Visitors Bureau on Monday confirmed to Dollymania that June 19 is indeed the new date for the opening of Dolly's Dixie Stampede dinner theater in Florida. A press release formally announcing the change from its original May date is expected in coming days. Meanwhile, the Orlando Sentinel noted the new date in a story Monday about the name change of Dolly's partners in the restaurant chain, Herschend Family Entertainment Corp. And, as was reported here Sunday night, the Stampede's website (here) states that Dolly is planning to attend the opening ceremonies in June. Dolly was voted by fans as the Most Memorable Female Guest Star In A Comedy As Herself for her 1989 stint on Designing Women, TV Land announced Monday. More than 1.5 million votes were cast nationwide in several categories. No word on whether Dolly appeared at the ceremony already taped when awards were handed out, which will air on TV Land and Nick at Nite at 9 p.m. Eastern on March 12. She was up against Dr. Joyce Brothers for Days, Nancy Reagan in Different Strokes and Betty Ford in Mary Tyler Moore. Read a full list of winners in a press release here. CMT's Stars Over Texas special with Dolly aired Monday night (and CMT.com pictured Dolly and host Ray Benson from the show on the front page of their website throughout the day), and the Dallas Morning News gave the show a B, noting that Dolly's "still-poignant rendition of 'Coat of Many Colors' and her humorous duet with Mr. Benson, 'Leave That Cowboy Alone,'" were two of the three best moments of the show. Read the full review here. In an effort to market its 1 million photos to the public, the City of New York's archives this month began posting many of the pictures from its vault on the Internet and selling prints. Included in the collection now available to the public is a 1987 shot of Dolly with then-Mayor Ed Koch at Gracie Mansion, the official mayoral residence. An 8x10 print is $35, while an 11x14 print will run you $45 (plus $3 shipping). To take a look or order one, click here. A reader pointed out to me that the Dixie Stampede website is showing a different opening date for Dolly's new restaurant in Orlando, Fla. She tells me she heard that construction is running behind. Although I have not received any official word verifying which date is correct, as has been reported here numerous times in recent months, the local media in Orlando have been touting a May 23 grand opening with Dolly scheduled to attend, but the Stampede site lists a June 19 grand opening with Dolly in attendance. As soon as I get any official confirmation of which date is right, I'll pass it along. Thanks, Debbie! Remember that Stars Over Texas, the concert/variety special filmed last year in Austin with host Ray Benson, premieres on CMT Monday night at 8 p.m. Eastern. The show features Dolly, Vince Gill and several other performers. At the taping, Dolly sang "Jolene," "Coat Of Many Colors," "I Will Always Love You" with Vince Gill, "Leave That Cowboy Alone" with Ray and "On The Road Again" with the entire cast, although I don't know if all of the songs will be shown on the special (95 minutes of the show were filmed, but only 42 minutes will air). Paul over at Dolly Parton World alerted me that Dolly is expected to appear in a four-part documentary in Britain on BBC 2 titled The Lost Highway. Episode one aired Feb. 22, with episode two airing last Saturday. While Dolly was not in either of the first two shows, she is expected to appear in the third episode on March 8. Thanks, Paul! The official monthly charts for March by Power Source magazine are out now, and Dolly has some impressive showings. The Christian country singles chart finds "Hello God" from Halos & Horns moving up five to No. 4 while "Stand By The River" with Dottie Rambo drops six to No. 24. The charts are based on airplay from a couple of weeks before, and given that "Hello God" has been No. 1 on their weekly chart for two weeks in a row, it now stands a good shot at becoming Dolly's second official gospel No. 1 on the magazine's April chart ("Stand By The River" was her first No. 1 in December). On their bluegrass singles chart, "I'm Gone" jumps up 13 notches to No. 10, while "Halos And Horns" moves up 12 spaces to No. 15 and "Stand By The River" falls five to No. 23. On their Southern gospel chart, "Stand By The River" falls eight spots to No. 29. Dolly helped the American Heart Association Greater Knox County Division over the weekend raise funds to fight heart disease in its annual Art for the Heart Ball, the Knoxville News-Sentinel reported Sunday. Jim and Kay Clayton placed the winning bid on a dulcimer autographed by Dolly auctioned off during the event. The auction, tickets, and other fundraising associated with the event brought in more than $320,000. Read the full story here. The Travel Channel has finally announced the air date for their special look behind-the-scenes of Dollywood (with Dolly included) as part of their Travel Channel Secrets series. The one-hour episode will premiere at 9 p.m. Eastern on Monday, March 24. Repeats are scheduled for midnight March 25 and 6 p.m. March 29. In explaining the show, the network called the park "an unnatural wonder of the Southeast" and noted that the episode will include "the bawdy fun of one of America's best-loved performers." As was reported here previously, the network interviewed Dolly at opening weekend last April about the park and returned for tours in June, filming segments on everything from how rides are constructed to a look inside Dolly's dressing room for her concerts. Their page about the show is here. Dolly's "Hello God" from Halos & Horns retains the No. 1 spot for a second week in a row in the unofficial weekly Christian country music countdown by PowerSource magazine. On the same chart, "Stand By The River," her duet with gospel legend Dottie Rambo and a former No. 1 on the chart itself, slips one spot to No. 20. In addition, "Hello God" comes in at No. 24 this week on the Indie World Country independent label country singles chart. Norah Jones, who took home a slew of Grammy Awards last week, told CNN in a story reported Friday that Dolly is among her big influences, along with Ray Charles, Aretha Franklin, Billie Holiday, Johnny Cash, Hank Williams and others. Jones is one of the many artists Sugar Hill Records has said have expressed interest in singing on the Dolly tribute album expected to be out this fall and was interviewed for the British documentary on Dolly which aired in January. Read CNN's profile of her here. British news agency Sky News on Friday reported that Dolly is writing a new song for Irish star Ronan Keating's new album, which he is currently recording in Nashville in an attempt to reach American audiences. The channel said Dolly is a "massive fan" and cites the Keating-penned "When You Say Nothing At All," the Keith Whitley classic which was also a hit for Alison Krauss, as one of her all-time favorites. Keating tells Sky News that he may even ask Dolly to duet on the album. Read the full story here. And speaking of duets, newcomer Joe Nichols told CMT in an interview published Friday that Dolly is his "dream duet partner." He said that singing with her "would be pretty cool. You know that would be the coolest as far as females go." Read the interview here.